Makhin made his debut as Bayan in ‘’Ruslan and Ludmila’’ at the Mariinsky Theater in St. Petersburg (1898). 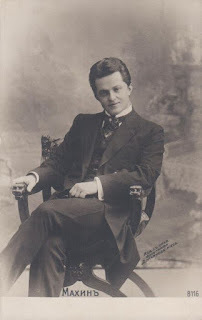 From 1898 to 1900 he was a soloist of Solodovnikov’s Theater. Here he made his debut as Lensky in ‘’Eugene Onegin’’. Since 1902 Makhin appeared in Odessa, Kiev (1903, 1906, 1908), Kharkov (1910), Tiflis (1907-1908) and Vilnius (1909, 1910). His special success was at provincial operatic stages. His repertoire included Werther, Don Jose in ‘’Carmen’’, Lensky in ‘’Eugene Onegin’’, Faust, Alfredo in ‘’Traviata’’, Dubrovsky.